I have a new found love this spring – Linen. Am I late to the party? I have no clue. Probably. But I’ve fallen in love this effortless, floaty look which makes you feel like you’re wearing pyjamas but can also look really smart. They’re a Spring essential, and will also be perfect and airy for casual summer days or travels to avoid sticky sweltering legs. Or just travelling in general, they’re so comfy and were perfect for my trip to Copenhagen! 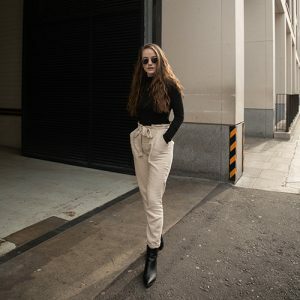 I recently bought these trousers from Primark for a whopping £10 and I’ve been living in them. The fit, the colour, the feel. Sitting at my desk feels like a cosy duvet day. I’ve been chucking them on with a black roll neck & ankle boots for a work-wear look. And, for a more basic look, I’ve been opting for a cosy jumper or easy oversized tee and Vans. They go with pretty much most things. You could also style them into the ‘all neutral’ trend, something I’ve not ventured into too much (I’m too clumsy with coffee and pasta sauce for that), or dress them up with heeled boots and a body suit if you’re like me and not one for skirts or dresses. But for this post, I’ve got my go-to ~smart casual~ look. I’ve been loving neutral tones recently. It’s been more of a venture from my usual black & grey combo. So I’ll definitely be adding a cream/brown touch to these when the sun comes out a little more. And I’ll also be collecting a few linen pieces, as they make for perfect wardrobe staples to last a long time. And despite the amount of steaming I’m going to have to do to keep them somewhat crease-less, I’ve already got my eye on this linen dress and jumpsuit. I’ve fallen for linen and I’m sure the love will last through until the autumn months. But for now, shop the linen edit below. I need to get myself a pair of these! I don’t own anything linen but I think they look lovely and are perfect for Summer when you might want to cover up but still stay cool. These would look amazing with a simple black bodysuit! Yesss you do they’re so comfy!! Yesss I can’t wait to style them in the summer! I love these and can’t believe they’re Primark! I love linen but find it a nightmare to wash and iron! Wow I love the trousers, they suit you so much! I’ve never owned anything linen, but I’m seeing a lot of it pop up recently so I may have to hop on the trend! Ahh thank you! Yess they’re so comfy and such an easy piece to style definitely hop on haha! I really love you handbag, you OOTD it´s simple but modern, you look very chic.